47703 2.6 years ago M.B. Hardy Raleigh, NC , US All candidates for President, the NCDP, Amnesty Int'l.-USA, the GAO, hundreds of lawyers and economists, all, have argued against it, esp. the ISDS provisions. 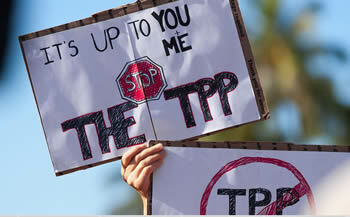 47697 2.6 years ago Nancy Mueller Chapel Hill, NC , US Stop the TPP before it is too late. 47696 2.6 years ago Nancy Mueller Chapel Hill, NC , US How do we stop the TPP? It is bad for the country and even for mankind. 47693 2.6 years ago Gavin Dillard Black Mountain, NC , US Don't do it! 47688 2.6 years ago Dan Shane Mountain View, CA , US ISDS USA sinister threat to democracy. Do not sign the treaty. 47682 2.6 years ago Anonymous Newton, NJ , US You were all sent to Washington, D.C. to do the work of and for the people. Now do it! We need jobs, jobs and more living wage jobs.